This afternoon I sit on the sheltered back porch and enjoy a soft summer rainstorm overtaking the backyard retreat. A low distant rumble predicts the storm will grow more intense, and soon it does. The hypnotic cascade of rainwater off the edge of the roof lulls my senses into forgetting everything outside this moment. Every day of our Ohio vacation usually has some distinctive element. Some days the kids play at the house, while some days we go on mini adventures. Occasionally we go on a bigger outing with the full family. Most days have a similar rhythm. With babies being the age they are, we can usually get out and do something in the morning, then play quietly in the house during an afternoon nap time. Yesterday we went to the library, the park and grocery shopping before returning home for nap time. That was just enough activity for our first post-arrival, post-holiday day. 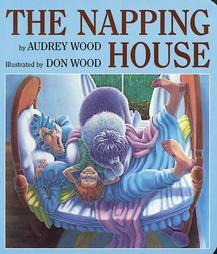 A few years back my Aunt Linda gave us a book for our children's library, The Napping House. I love the rhythm of this story that tells of a kid with a dog and a cat and a mouse and several other things sleeping on top, all in the Napping House, where everyone is sleeping. I get sleepy reading this story to my kids. I also get sleepy whenever I visit my parents' house. And everyone else gets sleepy too. Rooster and I both take regular naps here, and we all go to bed early and sleep late. There is just something peaceful about the spirit of this place. I think of it as an annual recharge for my batteries. I think Rooster grows an extra inch each year just by virtue of all the extra sleep he gets in Ohio, in our very own Napping House. He is, in fact, sleeping right now. Poor guy doesn't even know his cousin Gabe is here playing with the Thomas trains without him, but I know from past experience that there is no point in waking him now. My mom the weather watcher correctly predicted this rainstorm would be arriving around naptime today, so she and I maximized the morning and took the kids on a nature outing. We even had time for a picnic lunch. A 30 minute drive took us to a park along the Cuyahoga River. For free, we got to park at the trailhead of the old towpath and walk along the river, which has now been paved for bikes and strollers. Mom and I walked the path, while the kids meandered. Boo narrowly escaped being run over by a bicyclist before I was able to impress upon her the importance of meandering along the right side of the path. The path under the tree canopy included a couple of bridges, half a dozen caterpillars, and millions of trees and flowers. The kids got a good botany course, including how to identify poison ivy and milkweed. From previous discussions we already knew that poison ivy = bad and milkweed = good for monarch butterflies. The pollen in the air was intoxicating and a little overwhelming, but we did get to walk about a mile in and a mile back. Back at the trailhead, we sat at a little old train station overlooking the river to eat our lunch. And right on time, the 11:20 steam train pleasure tour pulled up and stopped right in front of us! Twenty or thirty passengers got off and on, then the train went on its way. Lulu kept saying, "Whaow!" over and over. After the passing of the train, Boo Bear and Rooster continued to find wonders all around them. They found wild strawberries and a giant blue dragonfly. Then as they were walking along the rails, I casually pointed out one weed and mentioned it looked like a carrot top. There was nothing for it but to pull the weed, the root of which sure enough turned out to look like a crooked white carrot. It looks like a carrot. It smells like a carrot. It is definitely a wild carrot! And with that, she dropped it and went on her way. Vacation has already given us some adventures and some chances to rest. The kids are spending 90% of their time outdoors, digging under rocks for pillbugs and caterpillars. Yesterday they found some larval stage fireflies, which are about the strangest thing I have ever seen: little white wormy things with glowy ends. The rain has passed, Boo and cousin Gabe are moving their quiet indoor afternoon back outside. Maybe they will play in the Eeyore House awhile. Who knows what wonders await just around the corner? For today, what we already have is enough. Wow. I am so jealous! Yall's trip looks/sounds so awesome. And we have The Napping House book too....so great!